We are here to fill your buckets with some of our weekly INSPO and our #NEVERMISSAMONDAY roundtable talk. Today we are talking about seizing the day. It’s not about ‘having’ time. Because really, we all have the same amount of time each day. It’s about MAKING TIME. For our VFit 21 Day Fitness Reboot, we designed a game we like to call Yango! It just so happened that it’s also really fun to shout out YANGO each day as you complete your mission. In Yango, you have a playing card with 21 daily fitness/self care challenges. They range in time from 4 minutes to 30 minutes. Some are create your own workouts, some involve stretching, some require joining a VFit class and much more. It is up to each participate to strategically plan and complete ONE square per day. The goal of this game is to reboot our minds and bodies to show up for 21 days straight and to realize that we DO all have some time each day for our own health and well being. It’s been amazing to watch play out! If you are finding yourself in a rut, or are feeling way too overwhelmed by life to fit any fitness in, we are here to help share some strategies for making time FOR YOU! What it comes down to is your priorities. When it matters enough – you find the time. You don’t miss important kids activities, work meetings, or appointments, right? Because you set those as non-negotiable and carve out the time to make them happen. The same habits can be built into exercise/self-care, but it’s going to take implementing some of the same procedures and habits you give to other priorities in your life. We have worked with thousands of clients over the years and when life gets busy and the going gets tough, many sacrifice their own self-care as the first thing to go. And you can’t water from an empty can, so we are here with some of our TOP tips to make sure that your health and well being stay a priority as we head into the craziest time of the year. BUT, if you aren’t quite there, and you are looking for a way to fit. It. All. In. // Tip 1 – PLAN and PEN out the time you WILL show up to workout. We will spend the most time on this one tip, because it’s the most important thing you can do. Sign up for a class, make a workout date with a friend, schedule it in your calendar, set reminders – do whatever it takes to give that workout time PRIORITY in your day. When we get new people trying out VFit, one of the first objections we hear is, “Well I don’t think your platform will work. You are asking me to book my workout in advance and my schedule is just too busy for that.”. And as you can guess, their workouts are not happening because they are not set with a high enough level of priority or with a built in plan. At VFit we ask you to schedule and book your workouts. That’s not meant for punishment if you can’t make it or need to cancel. It’s a PROVEN accountability measure and you are 100 times more likely to show up, if you have set that PLAN in place. If you have yet to try out VFit and given our platform a chance, follow this link and claim your free class (heck, we’ll even make it a WEEK), now! // Tip 2 -Don’t look at things so black and white. You do not need 30-60 minutes every day, in order for your workouts to make a difference to your life. If you can only get in 3-4 days of longer workouts, but still make it 5-10 minutes other days to just SHOW UP and do something – that is amazingly powerful. Again, we have worked with A LOT of people over the years. Those who fit movement and exercise into their lives MOST days of the week, are far more successful than those who just show up here and there. 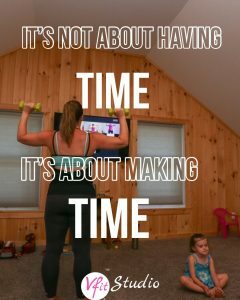 If you aren’t getting in workouts right now, consider mapping out the rest of your day to find 5 minutes and do an at home workout? Here is a quick circuit you can do to get your heart going and help you FEEL great in just five minutes: 1 minute jumping jacks, 1 minute dancing, 1 minute squats or stairs, 1 min wall sit, 1 minute plank on the floor or against a wall. (this is a great example of some of our Yango challenges that are getting our team to just SHOW UP consistently). // Tip 3 – Arm yourself with SUPPORT! We are human beings, we are not wired to be successful alone. If you aren’t getting workouts in and have NO one around you to support you to do it … find your tribe! There is a tribe out there for everyone, we promise. Whether at an in person gym, or with an online platform such as VFit where we come to YOU live to cheer you on, pick you up when needed and surround you with the most supportive and fun teammates out there. // Tip 4 – get it done before your day begins. Morning workouts get done before the chaos of your day has a chance to derail you. Plus, you start your day having completed something and it fires you up with the momentum to keep crushing life the rest of the day. It’s not going to be easy to get out of your warm bed, it never is! But when you treat your morning workouts as non-negotiable, have your clothes set out and coffee ready, and honor yourself with the sacred time of day for YOU – you’ll find you make a habit to start showing up. And we believe, that good habits once established, are just as hard to break as bad habits. Early mornings are THE most popular time of day at VFit for a reason. Our team is built of go-getters, doers and rockstars – they know that if it gets done in the morning, it’s done for the day! We have early bird workouts everyday set for both coasts. Even the sleepiest of heads have converted to early bird workouts once they tried it and felt the huge benefits of getting it in and done for the day! We all have 24 hours in the day – that is not going to change. When you prioritize your health and well being, those 24 hours can be lived at such a higher caliber that you may even feel like you created yourself more time! The payback from taking care of YOU comes in the form of increased energy, self-confidence, more presence in life and SO MUCH MORE! Our jam packed live streamed online fitness classes start at 3A PST and go all the way to 930A PST many days. We even have a VFit EXPRESS series of classes Monday through Friday that are 15 minutes start to finish. And if you can’t get a live class, we offer a full video library of on demand classes of each of our formats. Feeling like you can make time now? We sure hope so! Shoot us a note and let us know what option you are going for? We truly hope you take us up on some of these ideas and bring more movement into your life today and every day. P.S – And if you are looking to be surrounded by a positive and inspirational group of teammates and trainers that will change the way you approach life, the VFit team has a spot for you! Don’t go at your health and fitness alone.